“The Gift of Goodbye” is a memoir that deals with loss and the subsequent feelings of anger, sadness, depression and acceptance. In the face of a devastating divorce, author Rebecca Whitehead Munn, is unable to cope when she learns her mother is diagnosed with cancer. As Munn’s story unfolds, she begins to view her situation more constructively and sees destruction as an opportunity for growth rather than an obstacle. Delving deeper, she discovers her authentic self by becoming more present in the day-to-day moments. Part of this realization comes from watching her mother, Marjorie, choose to remain optimistic and brave as she rides out the storm of cancer. Marjorie demonstrates to her daughter how to accept a situation rather than wallow in self-pity, and, more valiantly, how to go forth with joy and experience life fully even in the midst of a grave illness. Munn applies her mother’s attitude to her own situation as a recently divorced parent of two young children. She follows her mother’s example and finds a way to emotionally detach from the negativity associated with loss through acceptance and abiding love. This book is a genuine tribute to Munn’s mother, Marjorie. Most of the story describes how Marjorie copes with two extreme bouts of cancer. By reporting this ordeal, Munn’s book becomes a play by play of the dying process. Most interesting is the section where Munn addresses spiritual topics and works to establish a connection with her mother for the time when the physical bond between the two of them will disconnect. In this way, the author’s story prepares us all for the inevitable eternal rest. At first, I was confused with the book’s subtitle A Story of Agape Love. 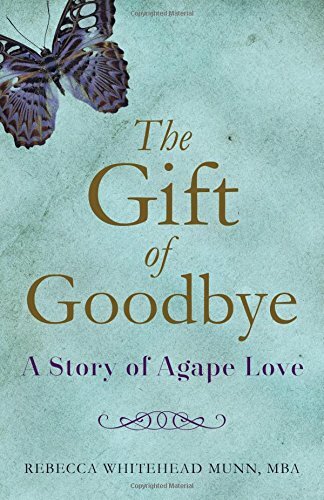 Not until the end of the memoir did I fully understand the meaning of the phrase, “agape love.” Although defined in the dictionary as Christian love, I like that the author expands on this by explaining that agape love is the most profound type of love - expansive and all-encompassing and completely selfless for the benefit of another. Munn goes on to tie this understanding into an even larger concept of love. To live each day to the fullest with agape love is to know that you are forever in connection with the spirit of your loved one. In this way, your beloved can be with you in times of pain or joy, covering you with affection and support. There is some repetitiveness when the story’s background information is relayed. When conveying the history of her mother and father, the author repeats some aspects that are covered in the book’s introduction. In the end, however, it is the honesty of Munn’s writing that makes this memoir worthy of praise. All across the pages she never fails to express the heart-pounding grief as well as the awesome joyfulness she experiences. It is as if we are walking along side her on the path to letting go. “The Gift of Goodbye” is about accepting faith; it is about overcoming fear to exist in the present moment and it is about opening your heart widely, even when that means exposing yourself to the sadness that comes when a loved one is near death. It is about believing that it is okay to allow the chapters of your life to unfold however they will. If you are facing the task of letting go of a loved one, Rebecca Whitehead Munn’s book can be a guiding light that helps you say goodbye.